The past few days have been spent doing taxes and it’s making me feel poor. Thank goodness potatoes only cost about $1. Because after seeing how much money we have paid the government this year, it feels like all I should be buying is a cheap ‘ole bag of potatoes and serving them for breakfast, lunch and dinner. 15-year-old me was very excited to receive my first real paycheck after 2 weeks of working after school as a receptionist at the hair salon in town. 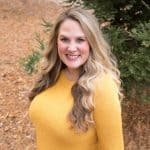 I answered the phones, scheduled appointments, helped ladies decide on which hair spray to buy, but mostly I was constantly sweeping up hair and taking out the trash. So. Much. Trash. Not quite as glamorous as I thought when I was applying there, but at least I had a job where I could wear cute outfits. After getting my first paycheck there were all these crazy deductions. I asked my dad, “Who the heck is this FICA and how come they get 18 of MY dollars! ?” Oh how I wish my deductions were still only $18. It’s just odd owing money come tax time. I used to get refunds! And then use that refund money to treat myself to a cute new outfit. But ever since getting married and buying a house, we’re writing checks instead of cashing checks come April 15. Guess it’s all part of becoming a grown up. When I was at the grocery store and couldn’t fathom spending $14 on 2 artichokes after crunching numbers all day, I settled on a nice affordable bag of potatoes instead. 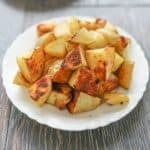 These oven roasted potatoes are one of my favorite side dishes to make. These are my roasted breakfast potatoes and my dinner side dish potatoes. Aren’t potatoes great like that? So versatile. After many, many, many attempts to create the perfect roast potatoes, I’ve discovered the 3 secrets to perfect oven roasted potatoes. The first is to preheat your baking sheet in the oven so the sheet is already super hot when you put the potatoes on. This will get them cooking right away and get you a nice crunchy brown skin on the bottom. The second is cooking them at a high heat, 425 degrees. This will crisp the outer skin and draw out the excess moisture. The last, and most important, is to bake them on top of parchment paper. This will guarantee that your potatoes won’t stick, and you won’t lose that crispy skin as you’re scraping them up off the pan. 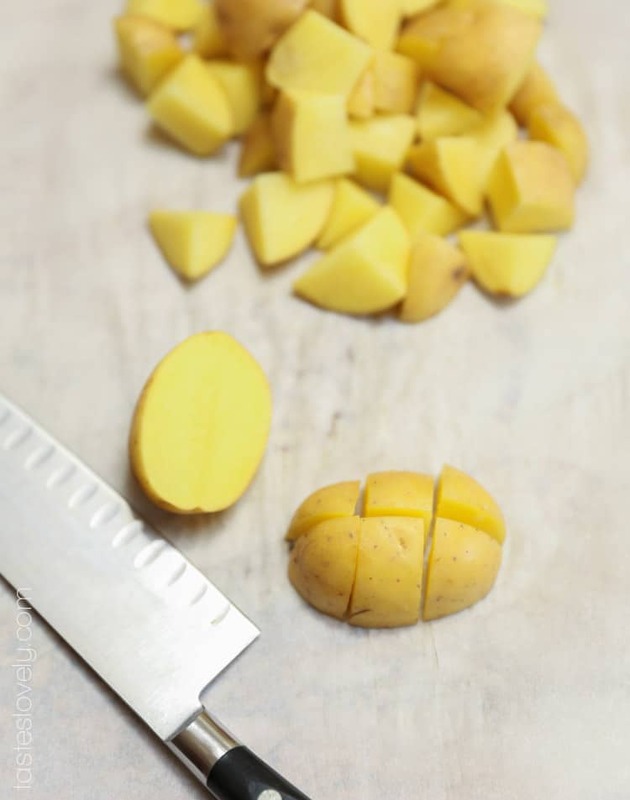 This method works with any type of potato: russet, yukon gold, red. I personally prefer to use yukon gold because they are so silky and smooth, but use whatever potatoes you have on hand. Preheat your oven to 425 degrees with your heaviest duty baking sheet inside as at preheats to get the baking sheet nice and hot. Preheat the baking sheet for at least 10 minutes. Toss the potatoes in olive oil, salt and pepper. Remove the hot baking sheet from the oven, line with parchment paper, and spread the potatoes in an even layer. You should hear them sizzling right away. Roast your potatoes in the top third of your oven for 45 minutes, tossing halfway thru. Serve immediately while warm. Will keep in an airtight container for 1 week in your fridge. Feel free to mix up the flavor by using garlic powder or adding in woodsy herbs such as rosemary or thyme. Awesome Natalie! Such a classic side, and thing that everyone should be able to make! 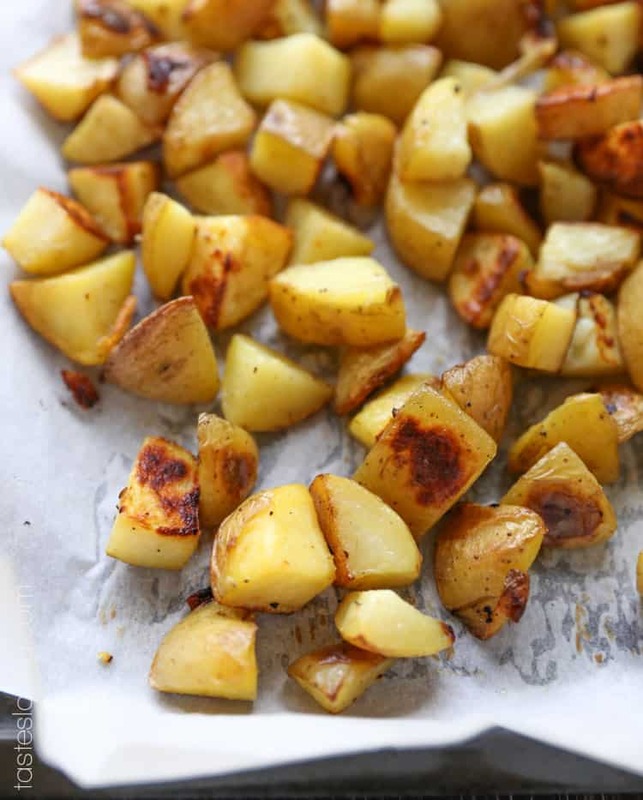 I love roasting anything in the oven…might be my favorite way to eat potatoes?! So depressing when you think about how much money gets taken for taxes, haha totally agree..FICA who?! Thanks for sharing the PERFECT way of making roasted potatoes :) Have a wonderful day! Roasting is my favorite ways to make veggies too Kelly. Just throw them in a hot oven and let it do all the work. And boo to taxes! I’m alllllll about these potatoes. Any meal, any time. And Yukon gold is my favorite, too! Love your roasting secrets. I always roast at high heat, but I think it’s a fantastic idea to preheat the baking sheet. I’m SO going to do that next time. Can’t get enough of crunchy potatoes! You need to try preheating the baking sheet Ashley! That’s how I get the nice crispy bottoms. Because when I’m roasting potatoes I want them crispy and crunchy. And OH MY GOSH! I *love* Subway Ashley! Seriously. There’s one next to my work and I go like twice a week. I bet you have some great stories from working there. Bet people ordered some interesting sandwich combinations. I bet you were a good sandwich maker and squeezed the mayo nice and even. I hate when they do one huge squirt down the center, ugh. Even after working at Subway, I will STILL eat there. I hear so many people say they can’t eat where they’ve worked, but not the case for me! I took the “Sandwich Artist” title seriously…I wanted the sandwiches to look good. Haha! I also thinks that’s where my love of real mayo came from. “Salad dressing” sandwich spreads just don’t cut if for me! Haha, I love that Ashley! I don’t think I would be good at Subway because when I make a sandwich everything has to perfect. I spread the mayo and mustard so both slices of the bread are evenly covered, I fold the meat so each bite has the same amount, arrange the veggies evenly, it’s nuts. I would hold up the line forever. Love these tips — and love potatoes! And ah, tax season is always such an unpredictable and stressful time. Writing another check to the government is definitely no fun, especially after seeing money drained from your paychecks every week. Sigh. Oh taxes, don’t even get me going on that subject. Natalie, you are a genius. Kurt, Briana and I are potato addicts. We love the darn things, I guess you can say we are a meat and potato kind of family. I am always scraping them of the pan and loosing that skin. So excited to try your method. Hmmm, maybe even tonight, since I don’t have anything definitive planned for dinner yet. We’re a major meat and potatoes family too. And I would feel like such an idiot every time I had to get out my metal spatula to try and scrape all the stuck potatoes up off the pan. Never again! Love back to basics recipes like this one. The potatoes look so lovely and crisp- definitely need to give your recipe a go! Thanks for sharing, Natalie! Ugh, I still haven’t done my taxes yet…I always procrastinate them. 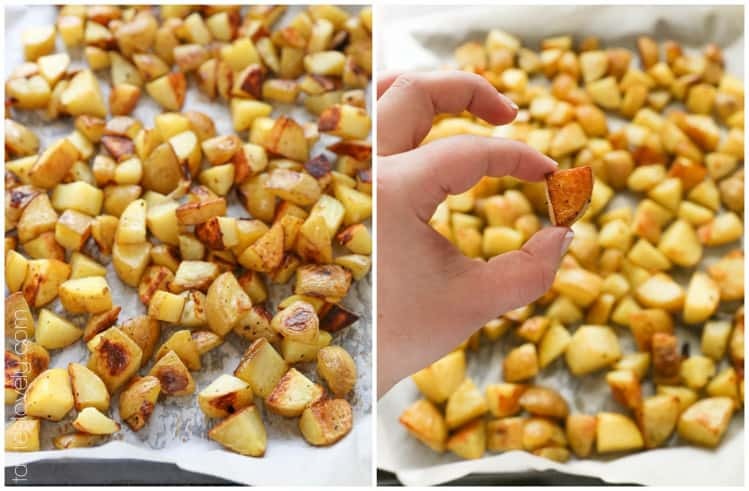 I love your tips for perfecting roasted potatoes – I will definitely be preheating the baking sheet next time – so smart! Potatoes…they are the balm to all of life’s problems. These look perfect. These certainly do look perfect! Yum! I love potatoes, especially Yukon Golds, they are so good! And I hear you on the taxes, we often owe, and it is such a bummer! Blah. This sounds like a good dish for our large family! Thanks for sharing! AHHH I still haven’t done my taxes (guilt alert!!!!) I will need this recipe ASAP. Love your trick about preheating the baking sheet too. I never thought of that! I hear you! Things are so expensive these days. I love how versatile potatoes are. Pizza, breakfast, salads, chips, you name it. These do look ultimately perfect! What a great story. My tax paperwork is sitting on the kitchen table, while I keep ignoring it. Potatoes are my favorite. Great tips, Natalie! I usually just throw the potatoes on the baking sheet. Now I know to bake them on top of parchment paper for a more crispier skin. Thank you! Ouch, taxes!! I’ve got all that coming up soon and believe me, it’s COMPLICATED here in Greece with multiple trips to the neighbourhood accountant who is very nice but smokes in my face the whole time! Glad you’ve got all that over with though and at least we got this great recipe and tips out of it. Love the tips because I love extra crispy roast potatoes!! Are taxed due April 15 in Greece too? I hire someone to do my taxes too, but lucky for me he doesn’t smoke in my face. That would drive me nuts! I love extra crispy roast potatoes too. When they’re “soggy” or “mushy” I can’t stand it! 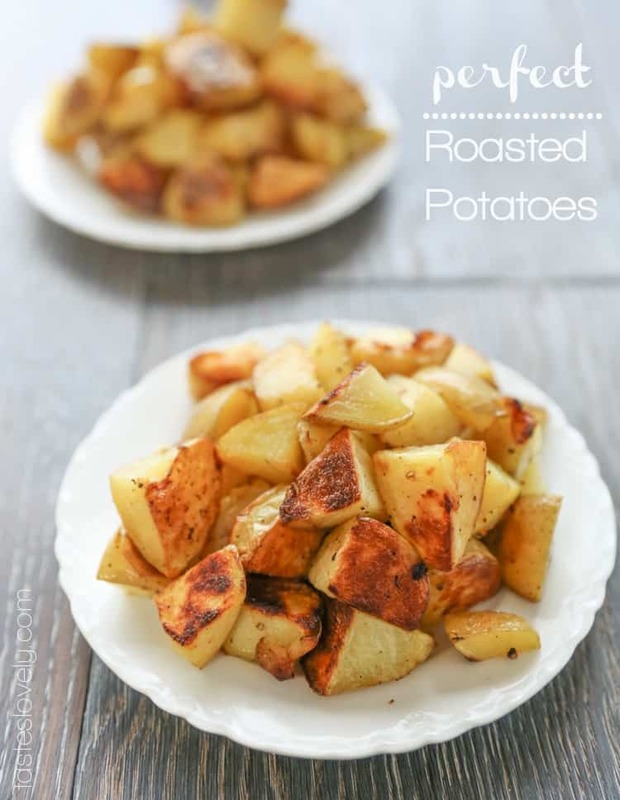 Your roasted potatoes look absolutely perfect Natalie and we could eat them for breakfast, lunch and dinner! The way we both like it, one side really crispy the other mouth-wateringly tender. Great idea with the preheated pan and will try it soon. Thanks so much Margaret Anne! You’re so sweet. Thanks God potatoes are so cheap, because electricity bills are taxes are getting all my money nowadays too :–( This looks like the perfect side dish. How yummy! Taxes are the worst! I still miss the days of getting a refund – that was the only downfall of getting married!! Thank goodness for potatoes. Cheap, comforting, and delicious! Great recipe!! These potatoes look so delicious! I love roasted potatoes. these potatoes are perfect! great post! more a URL changes, the more often it’s to index like a link destination. These were awesome with your Rosemary Honey Mustard Pork Tenderloin. I used Russets, threw them in a ziplock freezer bag with the oil, salt and pepper, and a new found seasoning by Frank’s, who make Frank’s Red Hot, don’t know if you can get it there? Shook’em up and roasted them. I have tried so many different recipes to keep life interesting and even though my wife and I like them if I get the bomb buzzer from either of my kids I feel like I’ve failed! The 4 I’ve tried here have gotten 4 thumbs up! Your hard work won’t go unnoticed here Natalie! Thank you! it is ccomplex to write. I came across your page by googling how to roast potatoes easily. This is the best and easiest recipe I have found. I love how quick and mess-free the recipe is. Pre-heating the baking sheet is brilliant idea. Btw I have already used the recipe so can confirm that it’s awesome. These are incredible. I just ate almost an entire pan to myself. I’m sorry that my family will not even know what they missed out on. I address paprika, garlic and onion powders but followed the recipe otherwise and they are crispy on the outside and fluffy on the inside. Potato perfection!!! Oh. My. Word. These potatoes turned out exactly how I was expecting!!! Perfectly crispy and deep golden brown on the outside and deliciously soft and moist inside. Thank you so much for the tips, this is definitely the best way to make roasted potatoes! I did add a few extra seasonings to spice them up a bit. Wonderful. Yea! I’m so glad to hear that Xanthe! This is still my go-to recipe. Nothing better than tender and crisped roasted potatoes! Thanks for taking the time to let me know you liked my recipe. This made my day!